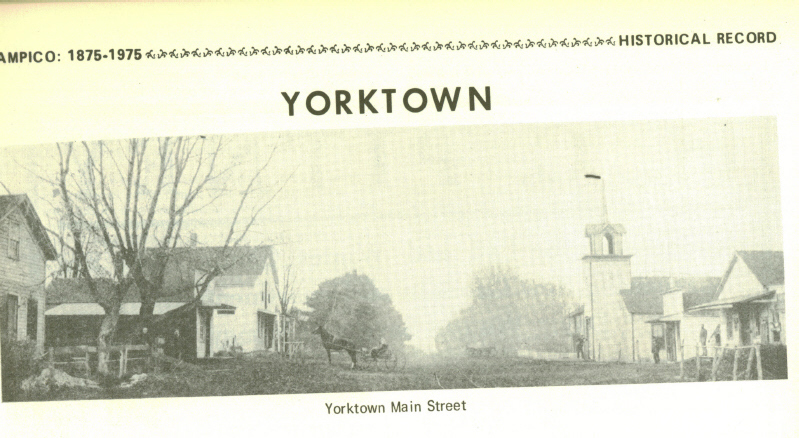 This is the "town" of Yorktown in Fairfield Township, Bureau County. This is seperate from Yorktown Township in Henry County! When Samuel Brady settled in Fairfield Township of Bureau County in 1839, he came to a land which until then had been known only by hunters and trappers, as well as the Pottawattomie Indians who had been here for centuries. At various times, tribes of Sac. Fox, Winnebago and Black Hawk had been known to have encamped here. Located in an area known as the Winnemago Swamp, Fairfield was the last part of Bureau County to be settled. This, of course, was due to the swampy condition of the land. The swamp itself was a beautiful paradise of wild vegetation and grasslands. Animal life abounded here, and as well as the smaller, fur-bearing animals, included bear and deer. The woods were plentiful with wolves and wild hogs. Prairie chickens, quail and wild turkeys were here in abundance. In 1837, by which time the county had received many settlers, the state constructed a road from Hennipin to Prophetstown. Passing through New Bedford, it followed the high ground taking much the same route as the present-day Yorktown to New Bedford blacktop. The year after Samuel Brady arrived here, Willam Adams came from Virginia in a covered wagon. Upon arrival, he was said to have owned two horses, two cattle and twelve cents. After spending the first winter in a dugout, he built a permanent log cabin in the spring. In 1842, Jacob Sells, Elijah Olmstead, Daniel Davis and Lewis Burroghs came to settle here. The Spring of 1846 saw the arrival of the first founders of Yorktown, John McKenzie and his family of nine children. John McKenzie, born in 1794 and of Scottish descent, was a veteran of the War of 1812. Two of his sons, Oliver W., and John M. shared a land claim here and broke the first prairie in Yorktown with an oxen team they rented for fifteen cents per day. Oliver McKenzie, the first blacksmith and store-keeper in Yorktown, as well as being the farmer, married Emily Dow in 1850. Emily was the oldest daughter of Whitcher and Eunice Dow who, although being born in Vermont, came here from New York in 1847. In that year the Dows, McKenzies and Sheldons undertook the organization of the village of Yorktown. On April 2, 1850, the first town meeting of Yorktown was held and Whitcher Dow was elected supervisor. Other officers were James Cain as town clerk, Rufus Sheldon as justice of the peace, G.G. Goyers as overseer of the poor. The pound masters were John McKenzie and Moses Hunt. In as much as many of the early settlers came from the state of New York, it has been common belief that this was where the village of Yorktown derived its name. Life for the early settlers was very difficult and aside from the problems encountered by most pioneers, the swamp itself added many hardships. Malaria, carried by the mosquitos that bred in the swamp, was common. When the rains were heavy, travel was difficult. It is reported that the area once expereienced electrical storms of the greatest severity. They came during the summer months and were extremely frightening and furious. Reportedly these storms ceased after the swamp was drained. Wolves that roamed the area in great numbers were a constant menace to the settlers and their livestock. The county determined to be rid of the wolves, offered a bounty. Organized wolf hunts were a major event, and often included men from many communities. The year 1850 saw the building of the Yorktown school, the first in Fairfield Township. Records show that in 1864, while Lincoln was president, the one-room school in Yorktown had an enrollment of 92 students under the age of twenty-one. The total enrollment of the five Fairfield schools was 330. These students attended school in separate, half-year sessions. As part of a state-wide program, the swamp was surveyed for drainage in 1852, An extensive program of ditching was undertaken to relieve the Green River overflow, but it took many years to complete. Professional hunters reportedly came to the area in 1890 and carried out ducks by the wagonload. Henry Thackaberry, an Irishman, came in Fairfield in 1852 and settled in an area then called Sodtown and known today as Thomas. Five years later, his brother Marcas, who landed in New York the same year the McKenzies arrived in Yorktown, bought 80 acres in the township. Another Irishman, Thomas Burden, came to Fairfield in 1852. He acquired 160 acres and built a log cabin measuring ten by twelve. He started farming and stock raising and bought more land until by 1885 he was one of the largest farmers in the county with over 2000 acres. In 1857 he donated land for a school which was built and called Burden school. When it first opened, the students sat on half-cut logs with pegs for legs and the teacher, Sarah Williams,, had no desk. The original building was replaced in 1904 by a larger one which was destroyed in the tornado of 1913. Again, it was rebuilt and still stands along Highway 92, a short distance east of Route 172. Yorktown got its own Post Office in 1853 and Rufus Sheldon was the Postmaster. Records show its total receipts that first year were $7.92. Postal service in Yorktown was discontinued in 1900. Thomas E. Dale came to Fairfield from England in 1855, the same year that Noah John Hogeboom arrived from Vermont. In 1857, Jacob B. Knowlton and James Graham settled here. When Mr. Graham first came to this county, he purchased 80 acres of grassland, but when he returned several months later to begin farming, he found his land covered by two feet of water. This Irishman stuck to his land and proved to be a successful farmer. When Fort Sumter was fired up in 1861, the citizens of Bureau County were shocked and angered, and immediately rallied to the colors. We know of at least four men from Fairfield who served in the war: John Howlett, William Johnson, Henry Thackaberry and Jacob Knowlton. Knowlton, who was twice wounded, participated in many of the battles and was with Sherman on his march to the sea. During the years following the war, Yorktown grew rapidly, as more settlers and immigrants arrived. The farmers began relying less on wheat and found the land very suitable for stock-raising and dairying. In 1869, Henry Cooley, whose ancestors came to America on the Mayflower, came to Yorktown and worked as a store-keeper for Oliver McKenzie for 14 years. He also was the deputy postmaster to Oliver McKenzie. The Masonic Lodge was established in Yorktown in 1870 and operated five years before moving to Tampico, where it was still referred to as the Yorktown Lodge. Another prominent figure in the story of Yorktown was Dr. Charles W. Morrill. When only 17 years, he went into the drug buisness and kept a store in Yorktown and Tampico. Desiring to be a doctor, he attended medical lectures in Cincinnati and graduated in 1876. After receiving his diploma, he permanently settled in Yorktown and had a successful practice for many years All reference to him were of the greatest respect and esteem. At this time, Yorktown had two other doctors who practiced from their homes. They were a Dr. Green and a Dr Bonnett. In 1898 the first telephone lines were constructed in Yorktown and Thomas. The switchboard in Yorktown was located in the general store. This store, which is still operating as a general store, was then owned by Freeman Foy. Yorktown, in fact, once had two general stores; a hardware store run by Adolf Bruder, George Hansens's blacksmith shop, a barber shop and a pool hall, a theatre and dance hall, a harness shop, an elevator and a tavern. The building of Highway 92 in the 1930's brought a great deal of trade to the community and the restaurant there was a favorite with truck drivers. The town also had overnight tourist cabins that did very well. When Interstate 80 was built across Illinois some ten miles to the south of Yorktown, it took away much of the trade that Highway 92 had brought. Fairfield Township also includes the unincorporated village of Thomas, which once had a much traded-in store. Today there is no business community in Thomas. One other settlement once existed in the township, that being Whippletown. It consisted mainly of a store run by George Whipple, but it never grew and eventually dissovled. Yorktown now has two churches: St. Paul Evangelical Lutheran Church and the Yorktown Church of Christ. Fairfield Township also claims the only Amish Mennonite Church in the county, built in 1944 by the rather large Amish community that came to this area starting in 1939. As well as the church, the Amish maintain their own cemetery and school system in the township. Yorktown today is a quiet and peaceful community consisting of a populace proud of its herritage and proud to be from Yorktown. Henry TAHCKABERRY, an Irishman, came to Fairfield in 1852 and setteld in an area then called Sodtown and known today as Thomas. Five years later, his brother Marcas, who landeded in New York the same year the McKENZIEs arrived in Yorktown, bought 80 acres in the township. Another Irishman, Thomas BURDEN, came to Fairfield in 1852. He acquired 160 acres and built a log cabin meausring ten by twelve. He started farming and stock raising, and bought more land until by 1865, he was one of the largest farmers in the county with over 2000 acres. In 1857 he donated land for a school which was built and called the BURDEN school. When it first opened, the students sat on half-cut logs with pegs for legs, and the teacher, Sarah WILLIAMS, had no desk. The original building was replaced in 1904 by a larger one which was destroyed in the tornado of 1913. Again, it was rebuilt and still stands along highway 92, a short distance east of Route 172. Yorktown got its own ost Office in 1853, and Rufus SHELDON was the Postmaster. Records show its total receipts that first year were $7.92. Postal service in Yorktown was discontinued in 1900. Thomas E. DALE came to Fairfield from England in 1855, the same year that Noah H. HOGEBOOM arrived from Vermont. In 1857, Jacob. B. KNOWLTON and James GRAHAM settled here. When Mr. Graham first came to this country, he purchased 80 acres of grassland, but when he returned several months later to begin farming, he found his land covered by two feet of water. This Irishman stuck to his land and proved to be a successful farmer. When Fort Sumter was fired up in 1861, the citizens of Bureau County were shocked and angered, and immediately rallied to the colors. We know of at least four men from Fairfield who served in the war; John HOWLETT, William JOHNSON, Henry THACKABERRY and Jacob KNOWLTON. KNOWLTON, who was ttwice wounded, participated in many of the battles, and was with Sherman on his march to the sea. In 1869, Henry COOLEY, wholse ancestors came to America on the Mayflower, cam to Yorktown and worked as a storekeeper for Oliver McKENZIE for 14 years. He also was the deputy postmaster to Oliver McKENZIE. Another prominent figure in the story of Yorktown was Dr. Charles W. MORRILL. when only 17 years old, he went into the drug business and kept a sotre in Yorektown and Tampico. Desiring to be a doctor, he attended medical lectures in Cincinnati and graduated in 1876. After receving his diploma, he permanently settled in Yorktown and had a successful practice for many years. All references to him were of the greatest respect and esteem. At this time, Yorktown and had two other doctrors who practiced from their hoomes. They were a Dr. GREEN and a Dr. BONNETT. In 4/*/ the first telphone lines were constructed in Yorktown and Thomas. The switchboard in Yorktown was located in the general store. This store, which is still operating as a general store, was then owend by Freeman FOY. Yorktown, in fact, one had two general stores; a hardware store run by Adolf BRUDER, George HANSENS' blacksmith shop, a barber shop and a pool hall, a theatre and dance hall, a harness shop, an elevator, and a tervern. The building of Highway 92 in the 1930's brought a great deal of trade to the community, and the restaurant there was a favorite with truck drivers. The town aslso had overnight tourist cabins that did very well. When Interstate 80 was built across Illinois some ten miles to the south of Yorktown, it took away much of the trade that Highway 92 had brought. Fairfield Township also includes the unincorporated village of Thomas, which once had a much traded-in store. Today there is no buisiness community in Thomas. One other settlement one existed in the township, that being Whippletown. It consisted mainly of a store run by George WHIPPLE, but it never grew and eventually dissolved. Yorktown today is a quiet and peaceful community consisting of a populace proud of its heritage and proud to be from Yorktown.